The newest line of Radwag Mass Comparators enables adjusting mass standards and weights according to the OIML recommendations (R-111) from 1 mg to 200 g for F2 class and lower. The comparators are used both for ensuring traceability of mass measurements, and verification of weights in accordance with the principles of legal metrology. RADWAG Mass Comparators have gained recognition among Accredited Calibration Laboratories in many countries. 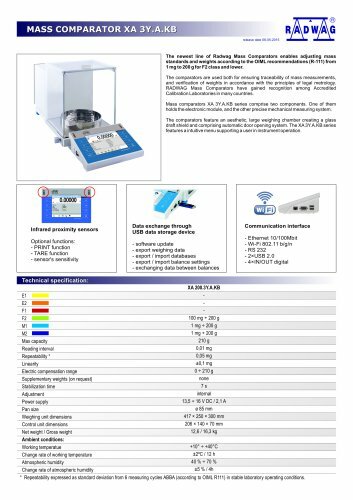 Mass comparators XA 3YA.KB series comprise two components. One of them holds the electronic module, and the other precise mechanical measuring system. The comparators feature an aesthetic, large weighing chamber creating a glass draft shield and comprising automatic door opening system. The XA 3Y.A.KB series features a intuitive menu supporting a user in instrument operation. Infrared proximity sensors Optional functions: - PRINT function - TARE function - sensor's sensitivity Technical specification: Data exchange through USB data storage device - software update - export weighing data - export / import databases - export / import balance settings - exchanging data between balances Communication interface - Ethernet 10/100Mbit - Wi-Fi 802.11 b/g/n - RS 232 - 2xUSB 2.0 - 4x|N/OUT digital Max capacity Reading interval Repeatability * Linearity Electric compensation range Supplementary weights (on request) Stabilization time Adjustment Power supply Pan size Weighing unit dimensions Control unit dimensions Net weight / Gross weight Ambient conditions: Working temperatue Change rate of working temperature Atmospheric humidity Change rate of atmospheric humidity Repeatability expressed as standard deviation from 6 measuring cycles ABBA (according to OIML R111) in stable laboratory operating conditions.